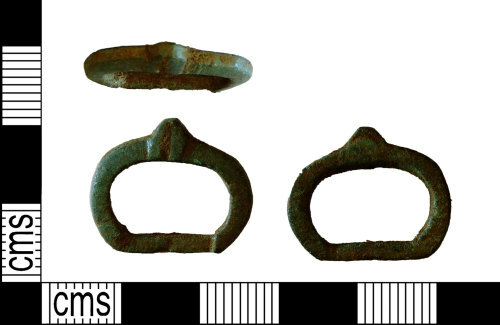 Medieval copper-alloy buckle, 19mm long, 16mm wide, 2mm thick and weighs 1.87g. The Buckle is D shaped in form and cross section and has a slightly recessed pin bar. It has a slightly protruding pin rest with an incised groove. It matches no 41 in Whitehead, R. Buckles 1250-1800.